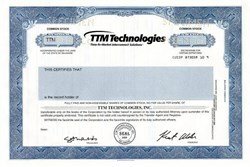 Beautifully engraved specimen certificate from TTM Technologies . This historic document was printed by Northern Bank Note Company and has an ornate border around it with a vignette of the company logo. This item has the printed signatures of the Company's President and Treasurer. TTM Technologies, Inc. engages in the manufacture and marketing of printed circuit boards. It serves networking/communications infrastructure, high-end computing, and industrial/medical markets. The company�s customers include original equipment manufacturers and electronic manufacturing services companies. TTM Technologies was formerly known as Pacific Circuits, Inc. The company was incorporated in 1978 and is based in Santa Ana, California.